Sometimes you have to admit defeat and that it's time to take the poor old dog outside to the yard and put the shotgun to use. If Heroes was a dog it would be one that's become confused and incontinent, not quite capable of operating healthily any more and whose quality of life is doubtful. NBC have started loading the shotgun but aren't quite ready to put the show out of its misery yet. Amidst plummeting ratings and mounting critical scorn, producers have been fired and the main creative force behind the barnstorming first season, Bryan Fueller, has been brought back to see if he can put the show back on track. Fueller's return won't have any impact until late in the second half of Season 3 and into Season 4, when he will be co-showrunner. In the meantime, Season 3 has been split into two arcs. The first, consisting of thirteen episodes, is subtitled 'Villains' and sees the show's roster of good and bad guys shaken around, with some good guys turning bad and some bad ones at least being teased towards becoming good. The second arc, 'Fugitives', will see most of the heroes on the run as the US government finally learns of the existence of people with powers and sets out to contain them. The first arc starts off strongly. Picking up the wreckage from the troubled second season, the heroes quickly learn that a formula exists that could grant powers to everyone in the world. However, a future incarnation of Peter Petrelli travels back in time and reveals that doing so will doom the world to destruction. A convoluted opening set of episodes reveals that someone long thought dead has returned to threaten the world and the heroes must act against him, but his agenda tempts some of the good guys to the dark side. At the same time, Sylar finds himself reluctantly joining forces with the Company in order to survive. The opening half of Heroes' third season is a mess, and no mistake. Character motivations are confused and not tremendously well-defined. Whilst the first couple of episodes succeed in giving us a rapidly-moving storyline and establish a clear threat to the world, the precise nature of that threat rapidly becomes diffuse (the exact, specific cause of the destruction of the world is never defined, unlike the first two seasons) and muddled. The big selling point of the season is characters swapping sides, but the reasons for them doing so are monstrously contrived and don't always make sense, particularly the evolution of Nathan's character. The nerfing of Peter and Hiro's powers, although interesting from a dramatic point of view, likewise feels too much like a set-up. The world-ending threat is also far too repetitive. For the third year running the entire planet is in danger and our heroes have to save the day. There's also the time travel, which now makes no sense at all. Amidst the dross there are some good ideas. Recasting Ali Larter as a new character (albeit one set up by prior seasons) is a good move and she works better in a supporting role rather than as a major protagonist. Moving characters who have nothing to do off-screen rather than trying to find things for them to do is also a sensible development. Individual character arcs also work well: new character Daphne (Brea Grant) has a good storyline and a fun power which is explored logically throughout, and her activities bring Matt (the always-likable Greg Grunberg) back into the main storyline. The attempt to push a wedge between the Hiro 'n' Ando partnership is clumsy, but the reunion between the two and their adventure in Africa is amusing. Kristen Bell's character, Elle, after being ill-served in Season 2 is given a much greater chance to shine in Season 3 as well. Unfortunately, the good points about the season only barely manage to keep the show's head above water. The trite dialogue, clumsy exposition, confused motivations and bizarre character twists make watching the show hard work this season, and it has to be said that NBC has shown remarkable confidence in keeping the show on-air for another year to see if Fueller can work his old magic on it once more. 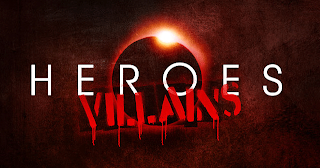 Heroes: Villains (**) has just finished broadcasting in the USA and UK. The next 'volume', 'Fugitives', will begin airing on 2 February 2009, and will frankly have to seriously raise its game to be noticed whilst Lost's penultimate season and Battlestar Galactica's final ten episodes are airing.